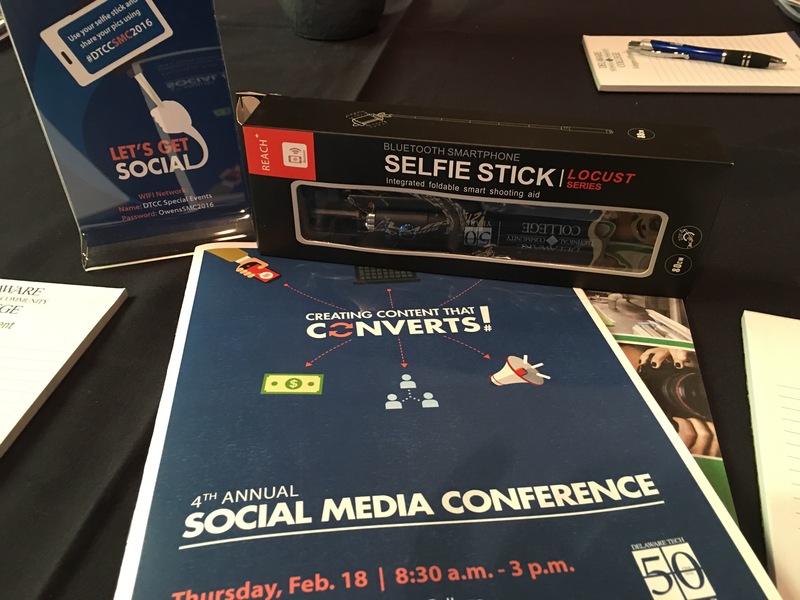 Yesterday I attended my first Delaware Social Media Conference, now in its fourth year and hosted by Delaware Tech Community College in Georgetown. I missed the first three, but I plan not to miss any more! Congratulations to everyone who planned, spoke and presented at this terrific day of professional development and networking! Make your employees central to your content, both as subjects and as inspiration for ideas (Scott Kammerer, SoDelConcepts, panel). Keep your ear attuned to customer’s everyday questions as a source for content. My favorite question of the day came from someone who had a propane business and wondered how to promote on social media. Conceding it was not a glamorous topic, it can be presented in an interesting way! How are propane tanks made? Why does propane gas smell? Do people decorate their tanks with art? Show it. Have fun with the story. Customers and employees can be wonderful Brand Ambassadors. Cultivate, then curate their enthusiasm, ideas and passion! Leverage Google’s suite of programs (Google+, Gmail, Google Places) to increase your SEO for your website. Google+ might not be the “hot” social media program, but if you are promoting website content on Facebook, copy and post it also to Google+. Add a website link to your Gmail signature. Register your business (free) with Google Places (GainWebsite.com). Treat each platform you use DIFFERENTLY. Automatic posts (the exact same content & wording duplicated across multiple platforms) is not cool. Strong visual content on websites is the trend, but for Google SEO, text is king. The more text the better. Readable. Every page should have 750 words (source: GainWebsite.com) and Google loves bulleted content. (Lesson learned). I got so much out of the Google/SEO session I am filled to the brim! Every 350 words or so should have an image (Ken Grant). Facebook business pages are pay to play. Getting the organic reach we used to is long gone. Lay off the hard sell. You want more followers, sales, attention? Then use social media to have conversations. Share other people’s content. Be a part of your on-the-ground community as well as the virtual one. Be authentic, real, natural. Not canned. Not automatic. Not a robo-poster. Careful with scheduled posts. Not cool to pitch a product or service when a national or global tragedy is unfolding. Evaluate all scheduled posts during breaking news and be prepared to remove them. (Mariah Calagione, DogfishHead beer). The social media landscape changes and evolves continually. Don’t get stuck in a rut. Be ready to adapt, change, and keep your ear tuned in to new trends. Asia is ahead of us on trends. Pay attention (Ken Grant). That’s why I’ll attend this conference every year!